Which Home Theater PC BestConfig do you like best? It's time to vote on your favorite build for this category! Please see below for a list of the choices available. Why are there no AMD E-350 builds in here? Everything I have read says they are excellent for HTPC builds and they cost ~$100 less then an i3. How can a HTPC with only a puny 64GB SSD be one of the finalist?! These builds are very odd. Only the first one has a TV card? SSDs for a HTPC build? SATA 6.0 harddrives? 120w PSU, and I think it's external? HTPC's should have dual cores or better, 4GBs of ram is fine. But they should also have large heatsinks to keep them cool without being loud, highly efficient PSUs so they don't use a lot of electricity, TV/Cable cards so you can watch/record stuff, large HDDs so you have the space to record your things, and probably AMD video cards so you can have high end HDMI with audio to hook up to your TV/AV receiver. About the best I can say for all those builds is they have Blu ray drives. Wireless is also a good idea unless you have a router in your living room. I'm voting the second one, but only because it has a 6670 GPU so it can double a mild gaming unit as well. Another series of sh!tty builds. HTPC's should not be relying on integrated Intel graphics. Went for the only choice that did not have integrated graphics but even that build has questionable processor and a very odd choice of case. How about something along the lines of this? Hdd: 160gb Western Digital 2.5"
OK now that is sweet! I say we add a write-in vote and give it to the Nintendo. This vote should be scrapped. All of the above HTPC are terrible. Two use integrated Intel HD graphics, which we KNOW gives lousy video quality compared to AMD or high end GeForce. And the AMD uses too much power and too big of a discrete card. It's a perfectly capable low end gaming build, but not an HTPC. Quite frankly, the list should include some of the lower power Llano APU's with no discrete graphics in the smallest form factor possible. 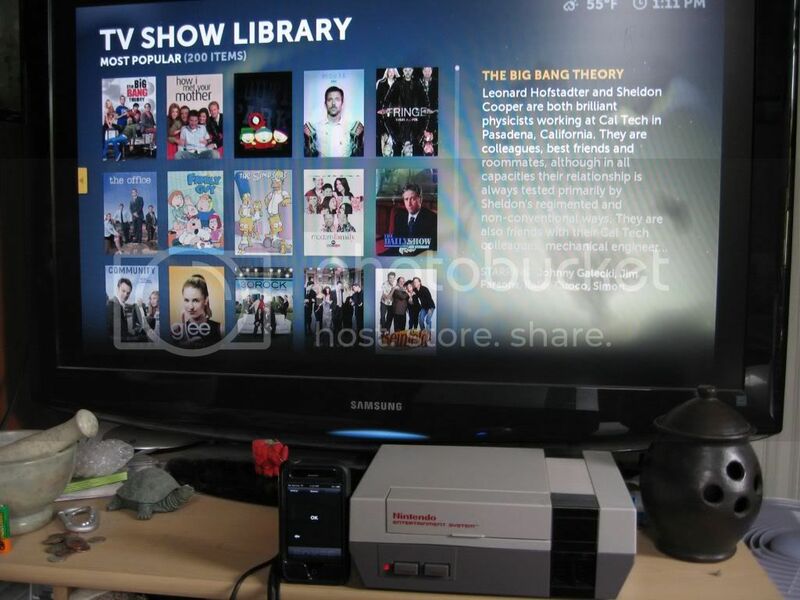 That would be the ultimate HTPC in my book. I'm not so sure the second one's GPU is to large. 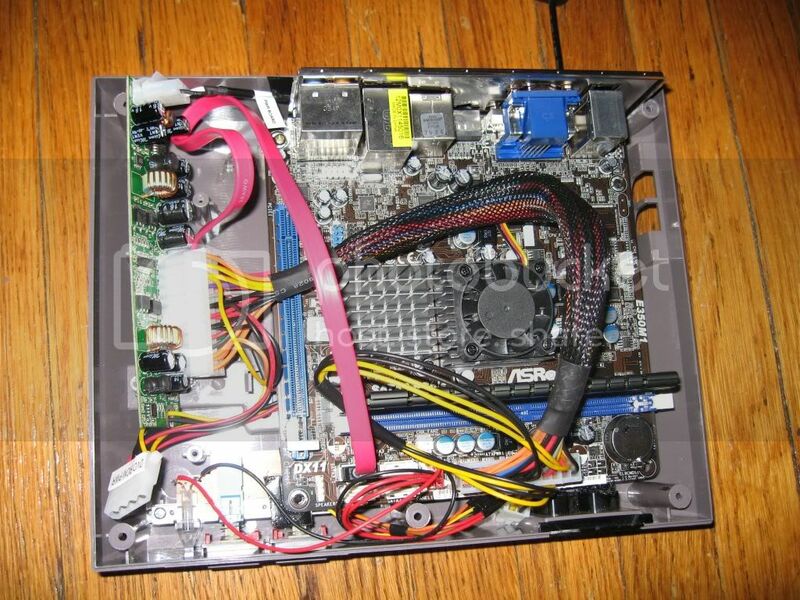 I remember reading about the HTPC abilities of the 5670 when it came out and it was the HTPC card to have. IGPs don't have the GPU power needed to do some of the high end stuff that few HTPCs need. The CPU is to large as you don't need an x3 for HTPC use. It also lacks the TV card that the first build has. This isn't the article I was thinking of, but it should give you a good idea of where the 5670 has issues. Prior to Llano, I wouldn't say the second one's GPU was too large. But considering Llano includes the GPU, there's no reason to do both--that's more what I meant. I agree that typical (non-APU) integrated is inadequate for high-end HTPC usage. Btw, that's the article I was expecting for the 5670's deficiencies. There's one that compares Intel HD 2000/3000 to integrated, I think, and that might explain more. I love my E-350 based HTPC. . .
For those of you complaining about lack of Llano, some of the candidates were submitted prior to the Llano launch. Keep that in mind. The HQV scores are quite subjective. Personally, I don't put to much weight on post-processing capability, though it depends on your source media I suppose. Most of my media is good quality to begin with. I also like that E-350 based HTPC. Why can't a build be high end? There was a $700 limit, and there is no use for high end gear for media playback. Funny, despite the "advice" in this thread my sh!tty HTPC builds with their puny 64GB SSDs and crappy Intel graphics seem to be working quite well anyway. Depends on what your trying to do. If you have it hooked to a 720 or perhaps even a 1080 screen with just using the audio found on the TV, your fine. (64GBs total for the computer? That's only 5 seasons of things assuming 20GBs for the OS.) I doubt however your system can handle higher end things like 7.1 bit streaming, etc. In addition, your intel graphics will have issues with odd pull downs. What you have is fine for a basic HTPC build like I had. You're kidding about this, right? The replies to this thread have got to be some kind of joke. You bit stream 7.1 audio off of your Intel IGP? No one else has to my knowledge. How'd you do it? Simplest way I've found is install LAV: http://forum.doom9.org/showthread.php?t=156191 and then configure the LAV Audio, checking all the bitstreaming checkboxes. Sending the bitstream to an AVR for decoding has almost no overhead since the stream is being decoded by the AVR not the PC. You can find several reviews and threads (e.g. AVSForum), that demonstrate support for 5.1 and 7.1 bitstreaming as well as 1080 video with very low CPU usage -- even with the new Celeron G530 CPU operates around 20% CPU usage viewing 1080 H.264 video. Latest drivers/BIOS also provide some of the best 24p support. If you don't need 3D support for can grab a G620 for $75 and a H61 motherboard for $80 and save even more money yet have a more than capable system. I've built both i3 and Pentium-based systems and honestly cannot discern performance or PQ. As for the SSD, I would never actually store media on the SSD. With several PCs around the house, media is aggregated on a low-power 24/7 home server. How much and where the disks are located is a bit arbitrary depending on how much media you plan to store. Some build 24TB arrays, some would be ok with a 2TB drive in their HTPC. It's therefore not really worth spec'ing out in a generalized build. Where the SSD shines is coming out of sleep, rebooting and launching media applications. Response time is critical in a PC that's trying to act like an appliance. I would not build an HTPC w/o it unless it wasn't in the budget of who it's being built for. As for E-350, you'll find plenty of reviews and experience saying there are performance issues. Hopefully, the E-450 will be that much better. Llano has yet to be proven and it was not available when these were spec'd. Right now though the SandyBridge setups beat Llano handily in price and for media usage, the extra GPU horsepower makes no difference. If a SNB Celeron for $55 can play H.264 video at 20% CPU usage why would you buy the $80-$120 Llano? For post-processing? Then why is the most widely recommended ATI CCC setting to turn off all post-processing except deinterlacing? Beyond forums and reviews, my own experience building these systems for myself and others shows clearly the SandyBridge CPUs are currently the best bang for the buck for media PCs. They have full HD video and audio support, very low power usage (kill-a-watt readings around 80W using Prime95, 50W tops watching HD video, below 30W idle) and right now kill on price/performance. Two years ago, AMD was rocking this space and that's what I was building with. Now the pendulum has swung to the other side.